Here’s a look at some of the stats that stood out in Buffalo’s 30-27 win over Tampa Bay. 3 – the number of takeaways the Bills registered in Sunday’s win. The scary thing is they could’ve had five total. Micah Hyde was grousing over his dropped INT and the Bills couldn’t come up with the fumble forced by Lorenzo Alexander in the second half. 11 – the number of tackles turned in by Preston Brown, who led the team and now has over 400 for his career. 107 – the receiving yards racked up by newly signed Deonte Thompson. 5.2 – the yards per carry average for Buffalo’s running game. 63% – the conversion rate for the Bills on third down, a season high as they were 10-16. 5 – the number of tackles for loss by Buffalo’s defense, despite having just one sack in the game. 434 – Buffalo’s total net yards in the game. 447 – Tampa Bay’s total net yards in the game. 69 – Tampa’s rushing yardage total. 173 – Buffalo’s rushing yardage total. One of Tampa Bay’s best defensive playmakers was out of the lineup last week with a hamstring injury, but according to Bucs head coach Dirk Koetter, LB Kwon Alexander has a chance to return to the defensive lineup on Sunday. Alexander led the NFL last year in solo tackles with 108 and was tied for third in the league with 145 total tackles. He practiced on a limited basis all of last week and was held out of the Bucs loss at Arizona. But it appears he is all systems go for practice this week. He was listed as questionable and will go through a pre-game workout, but Bucs top WR Vincent Jackson is expected to play today against the Bills. #Bucs WR Vincent Jackson (hamstring) has told a close friend he’s a fast-healer. He’ll work out pre game, but does expect to play. Jackson and fellow WR Tiquan Underwood are legit deep threats, but with Jackson’s hamstring a bit gimpy, Underwood may have to be the primary guy to stretch the Buffalo defense today. One additional note about Underwood. He has a propensity to put the ball on the ground, so Bills DBs are undoubtedly aware of that. Something to keep an eye on today. The Buccaneers have had a tough go of it on offense most of this season. Yards and points have both been hard to come by. All of it is rooted in their first down efficiency, something that Buffalo’s offense suffers from as well. Somehow the Bills have overcome it a bit better when it comes to scoring points. Tampa Bay stands 31st in the league in first down efficiency, gaining four yards or more on first down just over 41 percent of the time (41.7%). That ranks 31st in the NFL. (Buffalo is only marginally better at 29th in the NFL at 42.2%). That in turn leads to a lesser chance of getting a first down come second down where the Bucs move the sticks just 27.4 percent of the time to rank 25th in the league. (The Bills are actually worse at 25.5% to rank 28th). Come third down there’s usually a medium to long situation for Tampa, which is harder to convert. That explains their third down conversion percentage of 33.7% placing Tampa Bay at 28th in the NFL. (Buffalo ranks 21st). That leads to fewer first downs where the Bucs rank 28th with 211 (Buffalo ranks 21st). It also leads to more punts, which is why they rank 22nd in offensive possessions this season (139). Buffalo leads the league in that category with 161. These are the inefficient numbers that have head coaches like Doug Marrone and Greg Schiano working tirelessly to find solutions so their offenses can make positive gains more consistently. We’ll see if either of them can find those answers against a pair of solid defensive fronts. Tampa’s offense has struggled the past two weeks gaining a season low in yards over each of the last two games. Tampa head coach Greg Schiano was candid in saying he should’ve tried some gadget plays to spark his offense, especially in last week’s loss at Carolina. The comment below was quickly picked up by Coach Marrone. Marrone now has his team on high alert for a gadget play knowing Schiano’s feeling that he missed an opportunity last week increases the likelihood that they turn to a trick play this week if his offense is struggling against Buffalo’s defense. Buffalo’s kick coverage team fell victim to a reverse kick return on the opening kickoff against the Falcons last week, which gave the Atlanta offense a drive start at midfield. 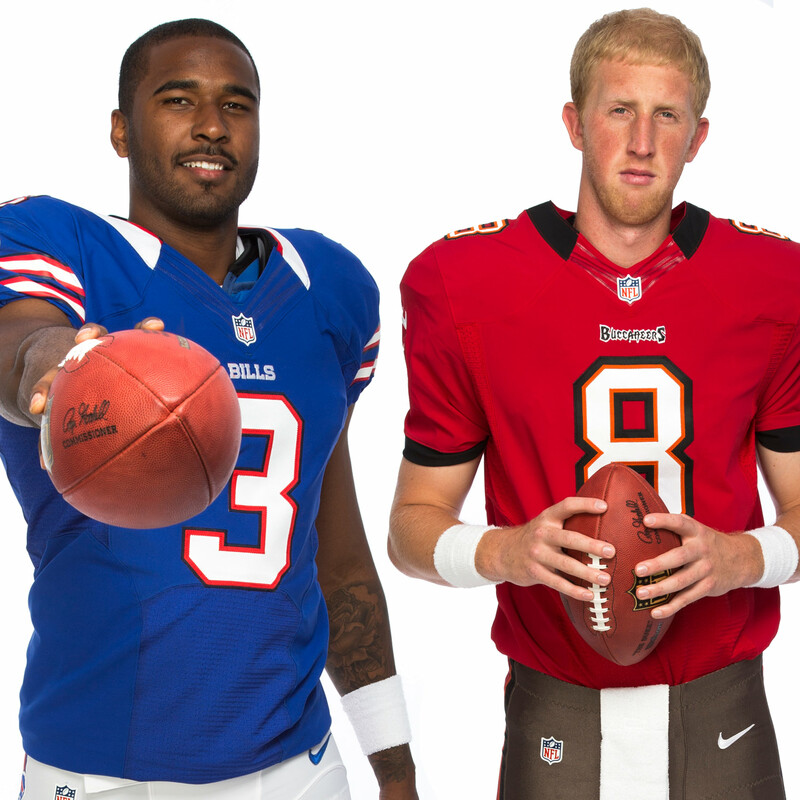 Bills defensive coordinator Mike Pettine has faced his share of rookie quarterbacks. Today he’ll face another in Mike Glennon. Here’s a closer look at his history against rookie signal callers. Pettine has compiled a 6-3 record against rookie quarterbacks holding them to a combined completion percentage of 47% (118-251), five touchdowns and 12 interceptions and a passer rating of 56.9. In those nine games his defenses have sacked opposing rookie QBs 21 times. Buffalo’s most recent game against a rookie QB was Week 11 against Geno Smith, who posted the lowest passer rating for a rookie QB against a Mike Pettine defense (10.1). The next worst performance was turned in by Josh Freeman, who was with Tampa Bay as a rookie in 2009. He had a passer rating of (12.1). Both of them had three interceptions with no touchdown passes. Smith passed for just 103 yards, while Freeman threw for only 93. Here’s a look at the full list compiled by Bills media relations. As we outlined in our Scouting Report on the Bucs this week, Tampa Bay has been outscored by a better than 2:1 margin in the second half of their games this season (140-67). That scenario only gets worse when you just take the Buccaneers scoring issues in the third quarter in 2013. Tampa Bay has managed just 24 points in the third quarter this season. That’s the lowest point output in that quarter in the NFL this season by almost two touchdowns. Tennessee is the next least successful scoring team in the third quarter with just 37 points on the year. The Bills rank right in the middle of the league in third quarter scoring with 65 points scored on the season. The Big East football conference is now defunct, but it’s where both Doug Marrone and Greg Schiano cut their teeth as head coaches. Marrone at Syracuse and Schiano at Rutgers squared off against each other three times between 2009 and 2011. In 2009, Marrone’s first season coaching the Orange, his team upset Schiano’s No. 25 Scarlet Knights 31-13 with Syracuse boasting a vastly superior rushing attack (does a similar strength exist for Buffalo now?). The following season Marrone and his Orange squeezed out a 13-10 victory with the winning field goal coming with just over a minute remaining. The 2011 meeting was the last before Schiano left for Tampa Bay and Rutgers needed double overtime to pull out a 19-16 win with a 47-yard field goal the difference. So Marrone has the 2-1 edge in record in head to head matchups between the two head coaches, and once again the odds makers believe Sunday will be a close game. Bills WR Marquise Goodwin was pulled out of practice early on Thursday after tweaking a calf muscle, but he’s expected to be fine for Sunday’s game at Tampa Bay. Goodwin practiced fully on Friday and is listed as probable for Sunday’s game.